Short version: Lloyd Houghton's Hap-A-Lan Hall at Market and Railroad was a happening place in the Roaring '20s. It was Newhall's community room — a place for parties and dances and banquets and Chamber of Commerce meetings. But on the night of March 12, 1928, the only "roar" to be heard was the roar of water rushing down San Francisquito Canyon when the St. Francis Dam broke. The Red Cross commandeered the hall and used it as a makeshift morgue. Afterward, nobody wanted to use it for social events any more. The Masons tore down the building and erected a new one: a 2-story Spanish stucco affair with a county courthouse on the ground floor and a meeting hall upstairs. The building still stands (2014). The Railroad Cafe is a fairly recent addition. 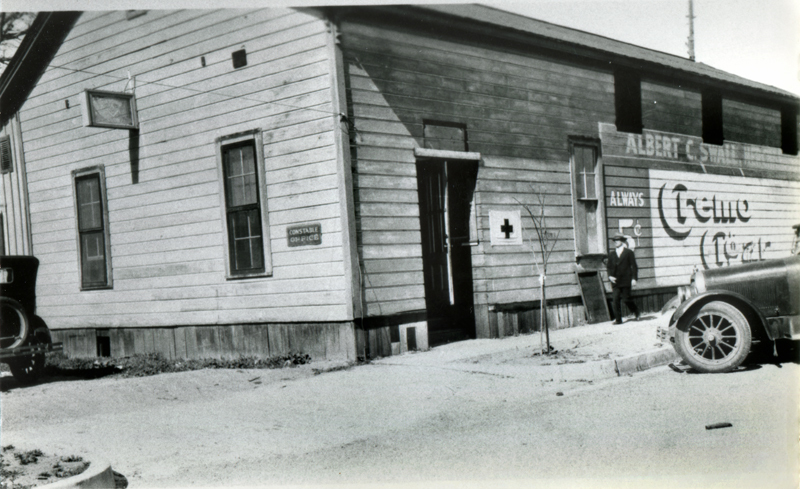 Lloyd Houghton's Hap-A-Lan hall at the northwest corner of Railroad Avenue and Market Street is used by the Red Cross as a temporary morgue for victims of the St. Francis Dam Disaster of March 12-13, 1928. The view is from Market Street, looking roughly north. This is the only photo we've seen of the exterior of this building while it was being used as a morgue — although we do have this film footage. It's also the only close-up we know of what was initially the back side of the building. The building faced Railroad Avenue when Joshua O. Newhall, a younger relative of Henry, built it in the 1880s as a dry goods store (grocery store) across Market Street from the Newhalls' Southern Hotel. The hotel burned down in 1887; sometime in the 1890s J.O. sold the store to James M. Gulley. In 1904, Albert Swall came on board to operate the meat market (butcher shop) inside Gulley's store; Swall was still the tenant (and was operating the whole store) when Gulley sold the property in 1906 to William Mayhue, who became a major Newhall property owner. In 1914, Mayhue hiked the rent and Swall retaliated by pulling out. He moved a block away (to the southwest corner of Market and Spruce, now Main) and most of the Railroad Avenue merchants followed. A leftover painted sign reading "Albert C. Swall, Merchant" can still be seen on the Market Street side of this building 14 years later. Around 1919, Mayhue sold the property to his son-in-law, Houghton, who converted it into a community room and dance hall. The photograph tells us several noteworthy things. For one, we see the building housed the constable's office. For another, the glass(?) sign sticking out the back tells us it was already being used as the Masonic Club. That makes sense; this building was the community room at this time — the local chamber of commerce and others met there — and after some 70 bodies were brought there for identification and transport to mortuaries, nobody wanted to use the building for social events any more. The building was razed and the Newhall Masonic Building Company Ltd. incorporated in 1931 to build a two-story combination Masonic Lodge and County Courthouse. Completed in 1932, the courthouse occupied the ground floor and the Masons met upstairs, where Hap-A-Lan's salvaged dance floor was reinstalled. In the 1970s, the upstairs space was known, appropriately enough, as "The Rafters" when the Canyon Theatre Guild used it. Later it became the meeting room for Alcoholics Anonymous. The 1932 Spanish stucco building still stands as of 2014. As for Cremo Cigars ... they might have been "Always 5¢" back then, but they aren't now. The company that resurrected the brand name in 1995 charges about $8 in 2014. FR2801: 19200 dpi jpeg from copy print.